This ‘Wheelchair Propelling Techniques’ section might (at first) seem pretty self-explanatory. You sit down and push with your hands right? Well actually there’s a bit more to it. Little adjustments with your body can make a big difference. Lets start with simply moving a chair over smooth ground. Make sure you’re siting comfortably, don’t slouch and place your hands on the push rims of your wheels. Gripping the push rims is largely about your own grip and comfort, hold the rims how you feel comfortable. What I would suggest is not having your thumbs around the rim, instead have your thumb on the outside of the rim, inline with your fingers. 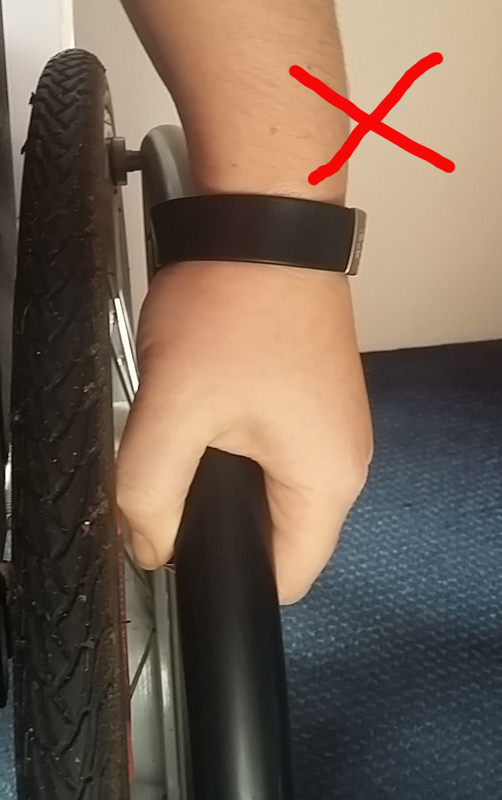 The reason for this (I learnt the hard way) is that at high speeds, such as whizzing down hills, it’s very easy to get your thumb jammed in the spokes. Holding the rims this way is also a bit cleaner if you’ve got dirty wheels. When it comes to moving the chair, reach forwards a decent distance and pull as far back as you feel comfortable. Aim to move your chair as much as possible (without hurting yourself or over reaching) with each push. Using lots of tiny pushes isn’t an efficient way of getting around and it’s sure to wear you out before you get far. If you’re aiming to go in a straight line try to push or pull symmetrically on both wheels. To turn a corner simply push one wheel more than the other or to turn on the spot push one wheel forward and one backward. The Wheel you turn backwards will be on the inside of the turn. Hopefully none of that is too much of a surprise for you, sit in your chair and just practice moving around, I’m sure you’ll get the hang of it pretty quickly. Curbs Ramps & Uneven ground. There are a few tips and tricks that need a bit more practice, these include curbs, ramps and uneven ground. For these it’s important to understand how shifting you weight in your chair can affect it. Lean forwards and you’ll put more force through the front casters (the little wheels). Lean backwards and you’ll put less force through the front casters. If you’re going up a slope leaning forwards will help avoid your chair tipping back. If you’re on soft ground and the front casters are sinking in try leaning backwards to help lift them out. For ramps with hand rails it’s also possible to pull yourself up using the rails. With narrow ramps you can pull yourself up using a kind of sling-shot action to make your way up the ramp. For ramps with one rail you’ll probably have to have one hand on a wheel. Curbs are a little trickier but with a bit of practice it’s fairly simple. In order to get up a curb you need to be able to lift the front casters completely off the floor. This is called the ‘Wheelie’ technique. When learning to do this I strongly recommend having someone stand behind you or using anti-tips to avoid tipping yourself backwards onto the floor. I’m not going to cover the wheelie skill set here but there are loads of instructional videos on YouTube and I’m happy to teach it in person. Plenty of wheelchair users use toe or foot propelling to make getting around easier. Toe propelling involves scooting forward in your seat so that your feet reach the ground. To do this you’ll either have to fold up the foot plates of your chair or tuck your feet behind them. Some people even remove the foot plates from their chairs to make toe propelling easier. Once you can reach your feet to the floor you can ‘walk’ your feet along the ground as you propel your chair to make it easier to get around. Some people move their chairs using just toe propelling but it’s pretty hard going. Toe propelling makes pushing your chair easier it’s also good exercise and helps keep your circulation going which can stop you getting cold. Toe propelling for short distances can also mean you have better use of your hands for important jobs like carrying snacks or playing Pokémon Go. The final benefit of toe-propelling is getting up ramps, not only does it help with the effort but being sat further forward in your chair can prevent you from tipping backwards on steep slopes. Most wheelchair users will tell you that whizzing downhills at super speed is one of the highlights of not walking. The one thing I would suggest though is wear gloves! Whizzing downhill at super speed is also a great way to melt your hands with friction. If holding the push rims is a challenge then you can cheat a little. When it comes to steering simply use the outside of your foot on the inside of the casters to change the direction of the wheels. 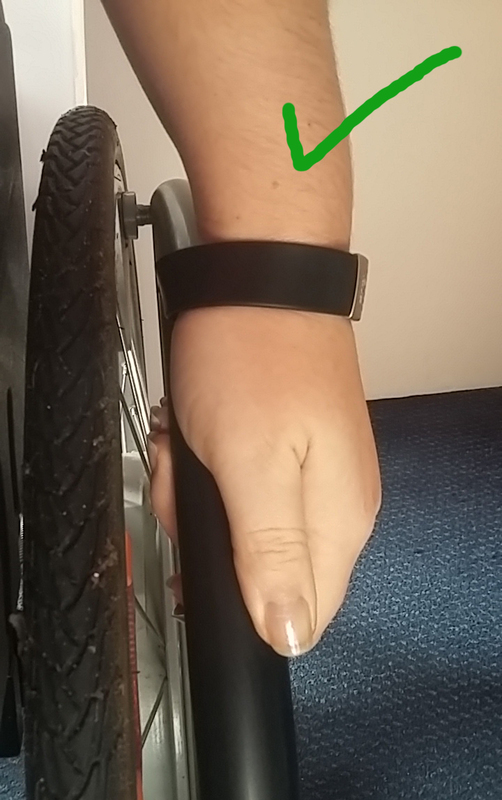 Nudge the angle of the wheel with your foot to change direction instead of relying on your hands. This is a agood technique to master if you also have upper body issues. You can thank Dominic (WheelWorldDad) for that one. If you have inventive ways of getting around in your chair I’d love to hear them. Please feel free to comment or drop me an email. As always questions and shares are welcome. Getting up curbs can be a real problem when using a manual chair, there is a curb climber which fits across the frame and sits in the centre between the footrests. This can make the tranisition a lot smoother and takes out a lot of the worry about tipping up. I love the tip about using your feet on the front caster wheels to change direction – genius!